From left, Gembrook Primary School students Austin, Matilda, Oliver, Anna, Cooper, Logan and Amelie are very excited for their movie night that''s coming up. 191716_03. Rescheduled due to the Bunyip State Forest bushfires, Gembrook Primary School is proud to be hosting its outdoor movie night on 29 March. This year’s film is the star-studded animated adventure, Smallfoot. The movie is a charming mix of positive messages, physical comedy, and a few catchy songs, all of which are sure to please young moviegoers. 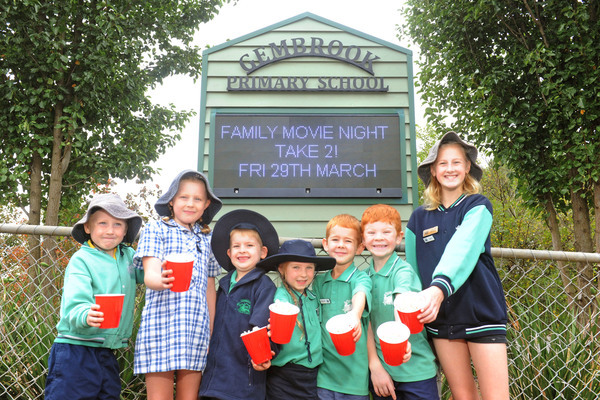 “The Gembrook Primary School outdoor movie night is a family favourite and the school is proud to provide local families with a wonderful night out.” school principal Brendan Fitzpatrick said. Grab a picnic blanket, pillows and rugs and lay out on the grass or go old school and watch from the comfort of your own car. Food trucks are available from 5pm and the movie is scheduled to start at 7:45pm. Tickets are $10 each (under two is free) and everyone is welcome to attend. Free popcorn and jumping castle will be included. The school is located at 50 Main Street, Gembrook.